What do obesity, cancer, heart disease, dementia, stroke, diabetes, irritable bowel syndrome (IBS), joint pain and many of the most feared illnesses of middle and old age have in common? Chronic inflammation could be to blame. With as many as 1 in 3 Americans sick and run down due to chronic inflammation, this condition is perhaps the biggest threat to our health today. In this article we’re going to take a look at the causes of chronic inflammation, common pro-inflammatory foods you should avoid and 7 delicious anti-inflammatory foods you should be eating. With all the worry these days about chronic inflammation, you might assume that all inflammation is bad news. But that’s not the case. Before we go any further, it’s important that we understand the difference between acute and chronic inflammation. Acute inflammation (that is, short-term inflammation) is essential to your good health. You see, when you’re injured or sick your immune system responds by sending an army of white blood cells to the place where you’re hurting. These white blood cells act like an elite SWAT team that attacks and destroys invaders like bacteria or cancer cells. This process causes inflammation. And without it wounds and infections would never heal. And your health would be seriously compromised. Think back to a time when you cut your finger or scraped your knee or elbow. Do you remember how the area around the wound became red, puffy, and warm to the touch? That’s acute inflammation at work. But with chronic inflammation, something goes very wrong. 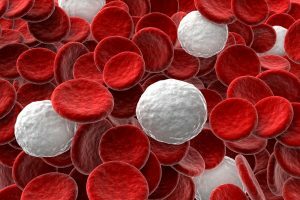 Your immune system may trigger a false alarm and your “SWAT team” of white blood cells battle through your body, attacking otherwise healthy body tissues. 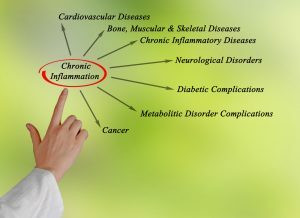 This chronic inflammation is like a raging fire that scorches your cells, triggering everything from autoimmune disease, heart disease, and cancer, to obesity, diabetes, and dementia. These chronic disease affect 125 million Americans. That means in the average family of three, at least one person has a disease caused by chronic inflammation. Although acute inflammation has been with us from the beginning, chronic inflammation is a new problem. And it’s one that’s caused largely by modern man-made environments and lifestyles. When I look at that list I get EXCITED. Because the vast majority of factors that contribute to chronic inflammation are manageable. They’re lifestyle choices. And that means even if chronic inflammation has you feeling like a sick, exhausted version of your true self right now, you can CHOOSE to bring this problem back under control. Continuing to read this article and taking action on what you’re about to learn is a great place to start. In today’s article we’re going to focus on nutrition. But we’ll explore other causes of chronic inflammation (and how to manage them) in the weeks and months to come. One of the biggest contributors to chronic inflammation is the Standard American Diet. Pro-inflammatory foods like red meat, cheese, processed foods, fast foods, and even “healthy” foods like bread and breakfast cereal can cause us to eat our way to a blazing furnace of chronic inflammation. Of the approximately 600,000 food items available in America, a full 80% of them include added sugar. Sugar is everywhere and it’s a major trigger for chronic inflammation. Always read food labels when shopping and try to avoid items that feature sugar (or sweeteners like high fructose corn syrup) as a primary ingredient. This one really hurts because I love to chow down on a thick, juicy cheeseburger. The problem is cheeseburgers are loaded with saturated fats and that’s bad news if you’re trying to cool inflammation. Why? Because saturated fats contain a compound (arachidonic acid) the body uses to create inflammation. If you can’t give up cheeseburgers completely (I don’t think I could), then limit them to a once-a-month treat. The Standard American Diet serves up far more omega-6 fatty acids than omega-3s — and that imbalance can lead to chronic inflammation. Cut back on vegetable oils (which are loaded with omega-6s) and eat more omega-3-rich food sources like walnuts and wild caught salmon. Up to 30 percent of Americans are now actively avoiding gluten. Scientists aren’t entirely sure how gluten triggers inflammation. But many believe that the gas, bloating and upset stomach that follows pigging out on bread and other gluten-rich food sources could be an inflammatory response to gluten. But just as certain foods can harm us, so too can others heal. Because you read our blog and emails, I know you’re interested in living a full, healthy life. Maybe you want to lose a few pounds. Maybe you’re looking for ways to increase your energy or improve a chronic condition like IBS or joint pain. Maybe you’re just ready to be back into control of your health. No matter how BIG the change you want to see happen in your life is, all change takes place one small step at a time. If you need to switch from a pro-inflammatory diet to a more anti-inflammatory diet, DON’T try to add all seven of the foods below to your shopping list at once. Too much change, too quickly, is overwhelming. And difficult. It’s much easier to start small — by adding one of these new foods to your menu per week — than it is to completely upend your established routines. These “micro changes” are much easier to stick with, and they’ll add up to MASSIVE results over time. Just imagine what life will be like when YOU have the body you’ve always dreamed of… when YOU have the radiant health you desire and deserve… when YOU are consistently and effortlessly making healthy choices. No matter where you are today, all that (and more) is absolutely possible for you. And it all starts with the first small change. And then the next. And the next. I’m proud of you for taking ACTION to improve your health and your life. You’ve got this! And all of us here at Perfect Origins are cheering you on. Let’s look now at seven of the best anti-inflammatory foods you can add to your diet. You simply can’t eat too many leafy greens like spinach, romaine, kale and Swiss chard. These vegetables are packed with anti-inflammatory flavonoids and are a good source of antioxidants that protect your cells. Plus, these vegetables have a low glycemic index which means you can fill your plate with them without filling out your waistline! If you’re like me and find yourself hungry between meals, a handful of walnuts make a perfect snack. Wild salmon is chock full of essential fatty acids, omega-3s in particular, which are some of the most powerful anti-inflammatory substances. Take special care to only purchase or eat wild-caught salmon, as farm-raised salmon can have up to sixteen times the amount of cancer-causing PCBs. Another suggestion is to get your omega-3s from a high quality fish oil supplement. You’ll be amazed at how at pharmaceutical-grade fish oil can help revitalize your heart. Improve your brain function. Ease stiff, sore joints. Give you healthier, younger-looking skin. And protect you against the poor health and painful diseases associated with chronic inflammation. I urge you to read this special report that details the many health benefits of fish oil. 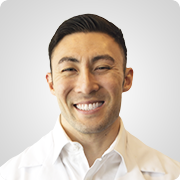 You’ll also learn why everyone from the American Heart Association to the Harvard School of Public Health urges older adults to add fish oil to their diets. Soothe Chronic Inflammation – FAST! ==> Get The Full Story Here! Turmeric, a tasty spice that gives Indian curry its distinctive golden color, can naturally soothe chronic inflammation. In multiple studies, curcumin, the active compound in turmeric, has been found to be strongly anti-inflammatory because it inhibits molecules that play a major role in causing chronic inflammation. Are blueberries the perfect fruit? They just might be! Cherries are another yummy fruit that packs a major anti-inflammatory punch! Cherries are loaded with a unique compound called anthocyanins that naturally mediate the inflammation process. Eating more anti-inflammatory foods like the ones above will do so much for your health. You may find that you have more energy, stronger immunity, improved mood, fewer aches and pains, and faster (much faster) weight loss. And because I’m a firm believer that one of the very BEST things we can do for our health is to ENJOY life, I want to share a fun, delicious recipe with you. 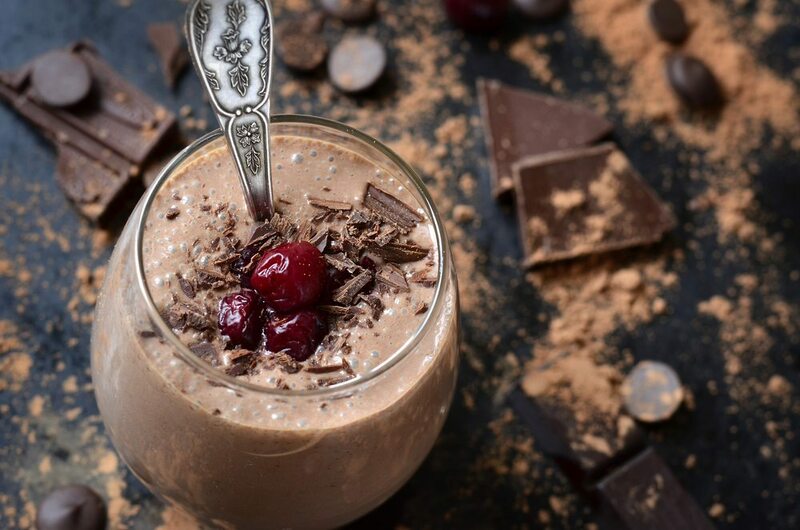 Picture yourself slurping down a rich, creamy, decadent chocolate covered cherry shake but instead of feeling guilty, you’re smiling because you’re doing your body good! A fantasy? No way! Just whip up the recipe below (takes about 5 minutes) for a feel-good, TASTE-GOOD treat! I enjoy this chocolate covered cherry shake whenever I’m in the mood for ice cream. It really hits the spot! Pour into two glasses. Bon appetit! Most folks who feel sick, tired and “run down” all the time have no idea that chronic inflammation could be to blame. And even if they’ve heard of chronic inflammation they may not realize that the foods they eat can have a dramatic impact on managing this condition. If you enjoyed this article please share it and help us get the word out by clicking on one of the social icons (Facebook, Pinterest, etc.) below. I really appreciate it! Your turn: What are some anti-inflammatory foods you’re going to add to your diet? I have MS and 4 levels of back problems which can’t benefit from surgery. I am in constant pain and taking 8 RX’s daily. I never feel happy anymore. I have been to every dr. in our area who deals with pain and even they are baffled. Hi Elaine, I’m so sorry to hear that. It breaks my heart. Don’t give up hope. If you are not getting results from the medical route, try an alternative route. There is an answer out there for you. I have a doctor who is revolutionary that does skype consults. I can do an intro for you if you’d like. Send an email to support@perfectorigins.com and put: ATTENTION DR CHARLES in the subject line. Hey Sally! Glad you like it! We’ll try to mix it up for you! I’m so proud of you Natalie! Way to take the information and use it 🙂 Remember that this is a journey and that all these little steps add up to make you the best you can be. Keep taking action and you’ll hit your goal and I love to hear that you are an example to your little ones! You’ve made my day today! I have had fibromyalgia, manic depression, narcolepsy,for over twenty years memory has started to become a huge problem. I have used Melaleuca products for over ten years and have helped but not enough obveously or things wouldn’t be getting worse. So much information I am not sure where to start. Please help me! Hey Tammy, sorry to hear that. Yes, information overload is easy to achieve now-a-days. So where do you start? 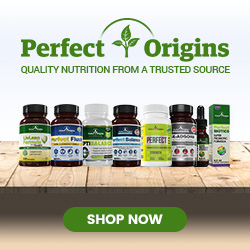 The Perfect Origins Fat Burning System is where I start all of my clients who purchase our Livlean product. We give it away free with your purchase. If you don’t have the program? Definitely start with diet. I’m a firm believer in your diet being the cause of most health problems. Start here: Cut out Wheat and dairy for the next month. Avoid any food that has white flour in it. Avoid milk, ice cream, yogurt, cheese, etc. Just STOP eating those foods. They are inflammatory and exacerbate those conditions. It will be hard for the first few days, after that it gets much easier. You can do it. 1 month. Report back to me and let me know how you feel. Hello! You can find plenty of information under the health/nutrition tab of this blog! Sorry to hear that Judith. We are here to help in any way we can! Hi Ekam, we are working on it! Stay tuned! I will reorder once i deplete my last bottle. I suffer chronic inflammation on my feet ankle due to diabetes.any newcformula to fight blood sugar control and inflammation then i am interested.